*PS Yes, I'm fiddling around with the blog design again, lol. Hang in there with me. I'll settle on something. This is beautiful!! I always enjoy seeing your painting. The girls are growing up so fast. I miss seeing them at church!! Kasie, Just perfect. They are beautiful and the painting is great. Kasie, beautiful! You've gotten the acrylics figured out. I like the redesign alot. 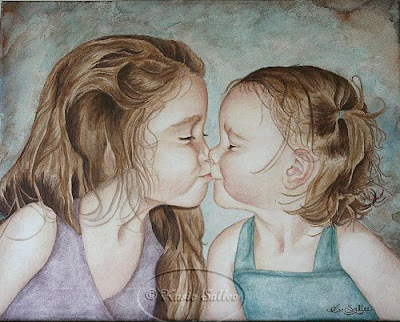 Congratulations Kasie, you've not only captured the affection of these two preciou sisters, but a wonderful innocence about them too. It really looks great in your banner too! love your new picture, it is adorable. This is truely precious!! I just love it!! It's so sweet. Thanks for sharing! The painting is breathtaking!!! You have amazing talent! BEAUTIFUL, Kasie! I like that you put it on your banner too! I can't wait to see your next one!